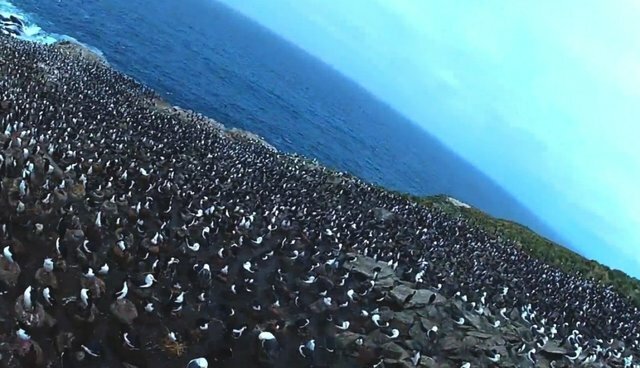 This bird-of-prey turned nature documentarian has captured some fantastic new footage of a massive rockhopper penguin colony on the Falkland Islands, all thanks to a cleverly disguised camera it mistook for a meal. The bird, a striated caracara, curiously pecks at the covert "egg-cam" before carrying it up into the sky, offering this unique aerial perspective of the colony, and just in time for Penguin Awareness Day, too. As cameras have become smaller and lighter in recent years, scenes recorded by birds have emerged as a welcome new genre of filmmaking -- one which, up until recently, could only be imagined.